In 1956, West Germany was permitted to start rearming as a key component of the Western alliance. Its first surface ships were ex-Allied types, but it was clear from the beginning that Germany’s expertise during World War II in the design and construction of advanced submarines and Schnellboote would soon result in the indigenous production of coastal submarine and fast combat craft. A head-start with the latter had been provided by Lürssen’s design of the Swedish ‘Perseus’ and the company’s part in the construction of the resulting ‘Plejad’ class of FAC(T)s, and this was reflected in Lürssen’s ‘TNC-42’ design for the ‘Jaguar’ FAC(T) type that entered West German service as the ‘Type 141’ class with great similarities to the Swedish ‘Spica I’ class. Such coastal warfare types were needed for the protection of West Germany’s maritime frontiers on the Baltic and North Seas, east and west respectively of the Schleswig-Holstein isthmus connecting northern Germany with Denmark. The 40 ‘Jaguar’ class units were delivered in the late 1950s and early 1960s as orthodox but effective craft with a full-load displacement of 220 tons on a typical Lürssen non-magnetic hull that had an overall length of 42.6 m (139 ft 9 in) and a beam of 7.0 m (23 ft 0 in) under an aluminium alloy superstructure. The hull was of wooden construction, and revealed its Schnellboot ancestry in the raised turtledeck forecastle with a semi-well for the forward gun. The propulsion arrangement was also typical of its time, with four MTU diesels delivering 8940 kW (11,990 hp) to four shafts for a maximum speed of 35 kt or more, and the armament was a mix of the standard and slightly unusual. The standard part was the gun armament, which comprised a pair of 40-mm Bofors guns located forward and aft in open mountings, while the more unusual part was the torpedo armament, which comprised two aft-facing tubes to launch Seal wire-guided torpedoes over the stern. Fire-control was entrusted to the Dutch WM-20 system, which had the antennae for the search and tracking radars in the spherical glassfibre radome above and behind the bridge. The type has disappeared from service with the German navy, which latterly designated the upgraded survivors as the ‘Type 142’ or ‘Zobel’ class. The type’s relegation from German service was made possible by the advent of more capable craft, but coincided with the need of some of Germany’s NATO allies for improved coastal forces. Thus Greece and Turkey each received seven operational craft as well as three craft to be cannibalised for spares. Another three craft were later transferred to Saudi Arabia. Additional construction resulted in eight craft for Indonesia and nine revised craft for Turkey. The Indonesian craft were completed as FAC(T)s, four of them with steel hulls and the other four with wooden hulls. The wooden-hulled type proved to have the greater survivability in tropical waters, and the two surviving craft are of this type. The craft built for Turkey comprise the ‘Kartal’ class of FAC(M/T)s, and these in fact preceded the transfer of ex-German ‘Jaguar’ class FAC(T)s. There are a few detail differences from the baseline ‘Jaguar’ class in the hull, but the propulsion arrangement and performance are broadly similar. Where the ‘Kartal’ class is a distinct improvement over the ‘Jaguar’ class, however, is in its impressive armament. This retains the two 40-mm Bofors guns and two 533-mm (21-in) tubes of the ‘Jaguar’ class, and has additional provision either for two more 533-mm tubes for a total of four heavyweight torpedoes in the FAC(T) mode or for four container-launchers for Penguin Mk II anti-ship missiles in the FAC(M/T) mode. In line with its FAC(M) capability, the ‘Kartal’ class also possesses a more sophisticated electronic suite than the ‘Jaguar’ class, its main element being the WM-28 radar fire-control system. The ‘TNC-42’ design was the first of a family of Lürssen designs that have dominated the market for fast combat craft since the mid-1960s. 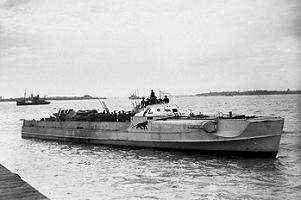 These craft have been produced with aluminium alloy superstructures on hulls of different construction (steel for the export market and wood over steel frames for the domestic market), and are characterised by a high length/beam ratio, a flush deck without the turtledeck forecastle of the ‘TNC-42’ design, and the bridge structure located just forward of the amidships position with a deckhouse generally located farther aft on the units of the larger classes. This layout allows the installation of guns forward and aft, with the room for torpedo tubes on each side of the deck and/or missiles between the bridge and after deckhouse. The machinery space and after portion of the hull are arranged in such a fashion that different propulsion arrangements are possible, with different numbers of diesel engines powering two, three or four shafts as demanded by the purchaser’s operational needs and financial resources. The smallest of the Lürssen FAC designs is the ‘FPB-36’ type dating from the early 1960s. Some 19 of the type were delivered to five customers in various forms as comparatively simple FACs with two or three shafts and gun, torpedo and missile armaments. Typical of them is the Spanish ‘Barceló’ class, whose lead unit was built by Lürssen and the other four under licence in Spain by Bazán, which also licence-produced the MTU diesels. These five craft were delivered as straightforward FAC(G)s with an armament of one 40-mm Bofors gun, two 20-mm Oerlikon-Bührle cannon in single mountings and two 0.5-in (12.7-mm) machine guns also in single mountings. The Spanish navy recognised, however, that the basic combination of hull and propulsion arrangement offered the possibility of greater combat capability, and therefore made provision for this in case it was required at a later date. The craft were thus fitted for but not with two 533-mm (21-in) tubes for heavyweight torpedoes in the FAC(T) role, while the omission of tubes and the removal of the 20-mm cannon allow the installation of four container-launchers for anti-ship missiles in the FAC(M) role. The ‘FPB-38’ class may be regarded as the larger half-brother of the ‘FPB-36’ class with slightly greater size and displacement allowing the installation of heavier armament. Four such craft were built as FAC(G)s for the navies of two Persian Gulf states, their most notable feature being a main armament of two 40-mm Bofors guns built under licence in Italy by Breda and installed in a Breda twin mounting. Malaysia required 18 of the type, but these were used mainly in the high-speed patrol role with armament limited to two 20-mm Oerlikon-Bührle cannon and two 7.62-mm (0.3-in) machine guns. Next up in size from the ‘FPB-38’ class is the ‘TNC-42’ design with which this important family of fast combat craft started. A general modernisation and slight enlargement of the design, to a length of some 45.0 m (147 ft 8 in) for a full-load displacement of about 260 tons, resulted in the remarkably successful ‘FPB/TNC-45’ type with provision for a two-, three- or four-shaft propulsion arrangement. The country responsible for the design was Israel, which had already turned to the concept of large fast combat craft after a reappraisal of the balance of naval power in the eastern Mediterranean during the first half of the 1960s. The correctness of this change of emphasis from medium-sized surface warships, such as destroyers and frigates, to a mix of small submarines and smaller surface combatants, such as the larger types of fast combat craft, was then confirmed by the shock loss during the October 1967 ‘Six-Day War’ of the Israeli navy’s flagship, the admittedly elderly destroyer Eilat , together with 47 men killed and another 99 wounded from a complement of 199. The loss was attributed to hits by P-15 Termit (SS-N-2A ‘Styx’) anti-ship missiles fired by ‘Komar’ class FAC(M)s of the Egyptian navy, whose most modern equipment had been supplied by the Soviets. Israel now decided to press ahead with all speed toward the creation of a navy based primarily on gun- and missile-armed fast combat craft for both offensive and defensive purposes. In the late 1940s, Israel had bought at least three and possibly as many as nine Vosper 70-ft (21.3-m) MTBs from the UK, complementing these in 1951/52 with six French-built ‘Ayah’ class MTBs. These latter were delivered with four 850-kW (1,140-hp) Arsenal-Marine Otto petrol engines powering two shafts for a maximum speed of 42 kt, and were armed with two 457-mm (18-in) tubes for medium-weight torpedoes as well as light gun armament. These 62-ton craft were generally operated as MGBs with the torpedo tubes removed, but in the early 1960s they were revised as MTBs with the two 457-mm tubes and a new propulsion arrangement of two 2,500-hp (1865-kW) Napier Deltic lightweight diesels. In 1967 the Vosper MTBs were reported to be unserviceable, but it is estimated that Israel could call on eight MTBs during the ‘Six-Day War’ with its Arab neighbours. At the naval level, the war showed conclusively that such boats were too small to be effective, and that missile-armed fast combat craft offered considerable advantages over torpedo-armed boats. The tactical importance of the anti-ship missile had been appreciated by Israel as early as the late 1950s, and the development of an all-Israeli missile of this type was put in hand during the early 1960s by MBT, a subsidiary of Israel Aircraft Industries and later known as Israel Military Industries. The resulting weapon is the Gabriel, which proved itself temperamental during its development testing in the late 1960s but soon matured into a highly capable tactical missile by the early 1970s and was then developed in variants up to the Gabriel IV with turbojet propulsion for a range of up to 200 km (124 miles) and the Gabriel V with an advanced active radar seeker optimised for performance in cluttered littoral environments. 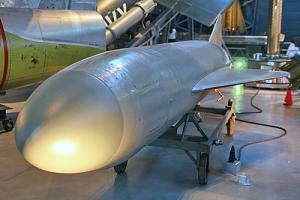 In its original form, the weapon is based on a cylindrical body containing the electronics, 100-kg (220-lb) high explosive warhead, and solid-propellant booster and sustainer rockets, and is supported in flight by a cruciform of rectangular wings which are located on the missile’s mid-body section and trailed by a cruciform of smaller tail surfaces indexed in line with the wings. The missile is mounted on a launch rail inside a container-launcher that can be located on a turntable on the launch craft’s deck. This allows the missile to be fired on the target’s bearing, launch data being provided by the launch craft’s fire-control system using data provided by search radar. After the boosted launch, the missile cruises on its sustainer motor at about 800 km/h (497 mph) at a height of 10 m (33 ft) above the sea under the control of an inertial system, though course corrections can be made by radio commands or by slaving the missile to an optical director. For the terminal phase of the attack, the missile’s semi-active radar seeker is activated and guides the weapon onto the energy of the launch craft’s radar reflected by the target; alternatively, the slaved optical guidance can be continued right up to missile impact. The Gabriel I missile has a range of only 21 km (13 miles), but the Gabriel II introduced wider-span wings and a longer body for a larger sustainer rocket, and can reach a speed of 850 km/h (528 mph) and a range of 36 km (22.4 miles). Further development yielded the Gabriel III with a larger 150-kg (331-lb) warhead, a longer body for a larger motor producing a range of more than 60 km (37.3 miles), and another seeker option in the form of active radar. The Gabriel III cruises at 100 m (330 ft) and then descends 20 m (66 ft) for the approach to the target before making the final attack at a preset height of 4, 2.5 or 1.5 m (13.1, 8.25 or 4.9 ft) according to the sea state. The possibility of using the various marks of the Gabriel missile in three differing models (fire-and-forget, fire-and-update, and fire-and-control) allowed the Israelis to develop the concept of a ‘cocktail’ attack by several missiles operating in different modes to confuse the enemy and his electronic countermeasures. This was still in the future, however, as Israel embarked on a large-scale programme to develop its navy along new lines after the 1967 war. For technical and tactical reasons, it made sense for the Israelis to turn to the Western world’s leading designer and producer of fast combat craft, namely the German company Lürssen. For emotional and political reasons it was impossible for Israel to be openly procuring weapons from Germany, so the order was handled through an intermediary, the Constructions Méchaniques de Normandie of Cherbourg in France. The resulting design was that now known as the ‘FPB/TNC-45’ type, and in 1965/66 Israel ordered two batches of six such craft as the ‘Saar’ class. The early history of these craft was chequered in the extreme. An initial four craft had been delivered without armament in 1967 before the outbreak of the ‘Six-Day War’, and were therefore not operational in this conflict. A fifth unit was delivered shortly after this, but France then embargoed the delivery of the remaining craft under pressure from the Arab nations. Israel nonetheless managed to extricate another five craft from Cherbourg in December 1969, under the Panamanian flag and in the guise of Norwegian oilfield supply craft, and these five craft then gave the basic design a classic reputation for seaworthiness and range by reaching Israel in January 1970. The last two craft were later delivered by France. The first six craft were completed in Israel with three 40-mm Bofors guns as FAC(G)s that also possessed a useful anti-submarine capability through the installation of four 12.75-in (324-mm) tubes for lightweight anti-submarine torpedoes launched on the basis of data provided by ELAC search and attack sonar. The second six craft were completed to a more powerful FAC(G) standard with a 76-mm (3-in) OTO Melara Compact gun mounting in place of the single 40-mm weapon located forward of the bridge; for reasons of weight, this installation meant that anti-submarine capability had to be omitted. Useful though it was, this FAC(G) standard was only an interim step on the way to the creation of a FAC(M) using the Gabriel missile. The first and last six craft were thus developed respectively to ‘Saar 2’ and ‘Saar 3’ missile-armed standards. In the ‘Saar 2’ this involved the installation of two single container-launchers for Gabriel missiles toward the edges of the deck between the bridge and the forecastle-mounted 40-mm gun, and the replacement of the two after 40-mm guns with trainable triple container-launchers for the same missile type. It was possible to omit the triple container-launchers and instead fit over the stern two twin 12.75-in tubes for lightweight anti-submarine torpedoes used in conjunction with EDO 780 variable-depth sonar. The ‘Saar 3’ standard was comparable but limited to six rather than eight Gabriel missiles in two triple container-launchers replacing the two 40-mm guns. The capabilities of the ‘Saar 2’ and ‘Saar 3’ class FAC(M)s were confirmed in Israel’s 1973 ‘Yom Kippur’ with with Egypt and Syria, when 13 Israeli fast combat craft with 63 Gabriel missile launchers were pitted against 27 Arab ‘Komar’ and ‘Osa’ class fast combat craft with 84 launchers for the longer-ranged ‘Styx’. On the first night of the war, five Israeli craft operating off the Syrian port of Latakia, some 200 miles (320 km) from their home base, encountered three Syrian ‘Osa’ class craft in naval history’s first missile-versus-missile surface action. The Israeli craft defeated 12 ‘Styx’ missiles fired in two six-missile salvoes, shooting one of them down with 76-mm gun fire and evading the rest with the use of electronic countermeasures, and then closed the range during the next 18 minutes to fire a salvo of Gabriel missiles that struck all three Syrian craft. Two of these sank immediately, and the Israelis used 40-mm gun fire to finish the crippled third unit. Two nights later, six Israeli craft were operating off the Egyptian port of Dumyat when they encountered a force of four Egyptian navy ‘Osa’ class craft. The Israeli craft evaded 12 ‘Styx’ missiles fired in four salvoes, and then destroyed three of the Egyptian craft, two of them with Gabriel missiles and the third with gunfire. During actions later in this short war, Arab craft fired another 28 ‘Styx’ missiles at Israeli vessels, again without scoring a single hit, for a 0% hit record during the war. The success rate of the Gabriel, on the other hand, was 85%. The Israelis were able to roam far and wide: typical operations saw patrols off the Syrian coast, where a complete armoured brigade was retained in case these harassments presaged an Israeli landing, and an incursion into the Egyptian anchorage of Ras Ghareb, where 19 armed fishing boats were sunk. In the course of the entire war, the Israeli navy suffered the loss of only three men killed and 24 wounded in the course of operations that resulted in the sinking of 19 warships of the Arabs’ regular navies. The naval operations of the ‘Yom Kippur War’ saw the fast combat craft come of age in coastal warfare. For the first time the emphasis was placed in operations by FACs rather than larger surface vessels for tasks as diverse as gunfire support of army units operating in coastal regions, and attacks on the enemy’s naval bases. This latter was particularly important, for it denied the enemy the tactical advantages of manoeuvrability while operating on the open sea. In these operations, the Israelis also made extensive use of helicopters for the mid-course guidance of missiles launched from their own FACs, and for the decoying of missiles launched by the enemy’s FACs.